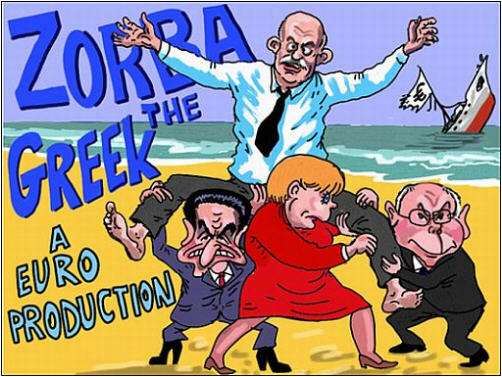 The Real Reason Why The Germans Won’t Help The Greeks « Dr Deborah Swallow – Global Cultural Diversity..
should shell out to help Greece has opened up critical new fault lines in Europe. Germany is taking a tough position by resisting giving help and even advocating that future bad debtors be kicked out of the single currency. How much of this is down to pure economics and how much is to do with cross-cultural differences? Undoubtedly, Greece is on the brink of bankruptcy and, according to some, has been allowed to spend far beyond its means without any regard for the consequences. The bitter Greeks believe this is all the fault of the Germans and agree whole heartedly with the discourse of the French Government who squarely put the blame on the shoulders of German competitiveness, citing its increasing exports to Greece – especially in military and defence goods – thereby making its own economy stronger at the expense of its neighbour. Unfortunately for Germany, they are the ones who will have to cough up the most money in the collective bail out. Recent surveys of German citizens show the majority are against giving any financial aid to Greece; “Our money must stay in Germany,” said one interviewee. “Bring back the Deutsch Mark,” said another. “If we give money to Greece, that just means our Government will have to increase taxes for us!” exclaimed one worker (source: France 24). With most Germans remembering the promises made to them, when they debated giving up the Deutsch Mark, that they would not have to pay for others financial mismanagement, one third are in favour of booting the Greeks out of the Eurozone. Few want to keep afloat a country that cannot even manage its own financial state. Germany is not alone with these views: Austria, Finland and the Netherlands think similarly. But, if we dig just a little bit deeper, are there other reasons for this new fault line? I would argue that there is nothing ‘new’ to it! It smacks to me of the perennial European North/South divide that lays along our cultural fault line. Those in the North stereotypically would view their Southern neighbours as ‘lazy’ saying they don’t like to work. Those in the South would view Northerners as ‘cold fish’ and always living by rules. So has today’s economic crisis bought our differences home to roost? In Northern Europe, culture, quite aside from the law, supplies a sin and guilt control mechanism. We have set rules for moral and ethical behaviour which we expect everyone to adhere to. The core value of a need to achieve is a stimulus for entrepreneurship and economic development. It is our psychological mainspring. Governments build their policies around this fundamental core value which affects the entire socio-cultural system. The Swedes ‘carry Luther on their shoulders’ and believe they need to do a good day’s work before they can partake in any reward – as do all the Nordic countries. Success equals personal achievement, the drive to get things done, and accumulating capital to gain status and wealth. In Southern Europe, shame tends to be the control mechanism, with one’s relationship to other people and to the group determining acceptable behaviour. Ethics is more related to the situation and who is involved, so ‘rules’ as we perceive them are often ‘broken’. Style is everything; manliness (machismo) counts and should be displayed; dignity and honour must be maintained. The Cultural Value of “The Public Man” is the desire to be someone rather than do something. Success equals social power; being someone personally important, being surrounded by people who look up to you and are dependent on you. Just across the Channel and beyond, being who you are counts for more than what you have achieved; security comes not from individual effort but from reciprocal relationships which mould your expectations of lifestyle and your place in society. Friendships are formal and a great amount of time is given to nurturing these. Large, extended families, including distant blood relatives and close family friends, are the norm which have strong emotional ties, giving a powerful commitment to family rather than the rest of the world. Taxi drivers and hotel receptionists often try and impress upon us, the foreigner, how well connected they are to give themselves status. In cultures like these, WORK per sé holds little value and is to be avoided if possible. Developing friends and connections is THE form of capital investment – not ‘personal development’ as we know it in the UK. The genteel pursuit of leisure gives status – not the image of industriousness and efficiency as in the North. The Germans (and much of Northern Europe) has a hard time understanding Greece’s problems. With an average retirement age of 53 (source: The Financial Times) and years of overspending, Greece was bound to run into trouble sooner or later. The cross-cultural differences abound with different definitions of what is right, fair and moral. But one thing is for sure, the cultures who believe in prudence, good planning and hard work will NEVER see eye-to-eye with the cultures that have a more laissez-faire attitude – and will question why they have to bail out such irresponsibility. This entry was posted on Friday, April 30th, 2010 at 8:24 am and is filed under cross-cultural differences, Europe, General, other interesting stuff . You can follow any responses to this entry through the RSS 2.0 feed. Both comments and pings are currently closed.